Other plants in the Hollyhock family. Seed seems to be the easiest way to propagate Hollyhocks. It occurs on mesic sites in deep, moist, but well-drained soil. In greenhouse conditions growing media used is 70% 6:1:1 milled sphagnum peat, perlite, and vermiculite and 30% sand. Seeds do seem to be considered difficult to germinate. 3. Wick, Dale; Evans, Jeff; Luna, Tara. 2004. Propagation protocol for production of container Iliamna rivularis var. rivularis (Dougl.) Greene plants (116 ml conetainers); Glacier National Park, West Glacier, Montana. In: Native Plant Network. 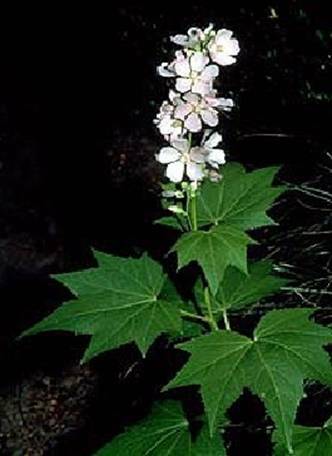 URL: http://www.nativeplantnetwork.org (accessed 6 June 2005). Moscow (ID): University of Idaho, College of Natural Resources, Forest Research Nursery.